It's heeeere: Finally, we get confirmation of the first Android tablet running the Honeycomb operating system. 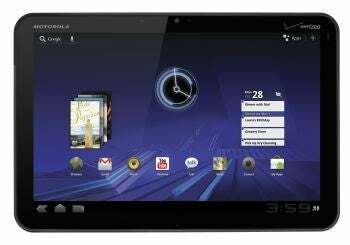 The Motorola Xoom tablet will be coming in the first quarter of 2011 to Verizon. No pricing has been announced, but Motorola dropped enough hints to get our juices going. The company announced its tablet just minutes before T-Mobile dropped news of its own first Honeycomb tablet, made by LG Electronics. For starters, the unit, like many being introduced this week, runs Nvidia's Tegra 2 platform, with a dual-core 1GHz processor. The Xoom will have a 10.1-inch 1280 by 800 resolution, 1GB of RAM, and 32GB of on-board user memory (plus an SD card slot). And of course, it will have Honeycomb, now officially outed as Android 3.0; and from what we saw in the on-screen demos and canned film, Honeycomb will be indeed be a very different Android experience than what's on smartphones today. Honeycomb has been optimized for tablets, and the iPad and Galaxy Tab-like split-screen views, the optimized Google Maps 5.0 with 3D mapping app, and other interface design points appear to bear this out. The Xoom will weigh 1.6 pounds, which is 0.1 pounds more than Apple's first-generation iPad, and measures 9.8 by 6.6 by 0.5 inches. That depth puts it right in line with the iPad, and with the Samasung Galaxy Tab. Its integrated wireless is native 3G, and can be upgraded to support 4G LTE, though it's not clear what's entailed to perform the upgrade, exactly. Also integrated are an accelerometer and gyroscope; Bluetooth; and 802.11n wireless with hotspot support. The 5-megapixel rear-facing camera with flash and 720p video capture, and has integration to output directly to YouTube, Picasa, and Facebook. The 2-megapixel front-facing camera supports video chat. Although video capture is just 720p, you can playback at 1080p. Motorola mentions it will have a Bluetooth Wireless keyboard, but didn't provide details on this. There will also be multiple dock options, including a Standard dock for chargin, and a Speaker HD Dock with speakers and output to TV, too. Let the tablet wars begin. Check out our complete coverage of CES 2011 .